It’s the time of the year when most seniors are starting to relax and enjoy the last few months of school. It is also the time of year when most seniors have heard back from all the colleges they applied to. For most, it is time to breathe a sigh of relief that the whole crazy application process is over. But there is one more decision that needs to be made and for most students it is the first major decision they will make as young adults. While some students have no trouble deciding on a school, others experience angst over the decision up to the very last day. If you are having trouble choosing a school than these six points might help make the decision a little easier. Financial Aid – If financial aid is important to you and your family than this is a great way to eliminate some schools. Review all the offers again with your parents and see which packages are the best. Any schools that are unaffordable should be removed immediately. The schools you have left should be ranked from most-affordable to least. Remember that whatever loans you take out will be your responsibility when you graduate. Major – Picking a major before you apply seems to be the norm these days and for some schools you are admitted by major. Look closely at those schools. Is the major something you would be happy pursuing? If not is it easy to switch majors? At some of the bigger state schools the answer is sometimes no. And of course if you have decided on a different major make sure the school you go to offers it. You would not want to spend four years studying something that doesn’t interest you. Size – Have you had the opportunity to tour schools? If so, what was the ideal size campus for you? If you haven’t had the opportunity where do you see yourself? Some young adults prefer a big campus in a vibrant city with opportunities everywhere you look. Others want the charm of a small school in a rural setting. Whatever you are looking for make sure the school you choose would be a good match for you. Culture – Research the culture of the school before making a decision. What is important to students at this school? Is there a big Greek presence? Is there a huge party culture? Is their opportunities for you to get involved in clubs or sports? Is there travel abroad opportunities? Whatever you are looking for in the college experience do some checking online to make sure the school has options that match your interests. Also read reviews from students, watch YouTube videos, and try your best to get a feel for the school. Housing – Dorms vary drastically from school to school as do options. Some schools have single rooms, others have quads, while some have apartment-like housing. You may want to see what is available at the college or university you are leaning towards. Also important is what kind of housing is there for all four years. Is there guaranteed on-campus housing? If not what kind of housing is available in the community? Is it affordable for a student’s budget? Is it in a safe area? When it comes to housing it is important to think about the long-term before committing to a school. Distance – Moving far from home can be both exciting and overwhelming. Before you commit to going across the country make sure you take into account the travel cost to get to and from school. And don’t underestimate how hard it is to be far away from your family. If you decide to stay closer to home think about the costs associated with going home on the weekends. If you live close to a school and are thinking about being a commuter student make sure your financial aid is based on living at home as it sometimes changes your aid package. 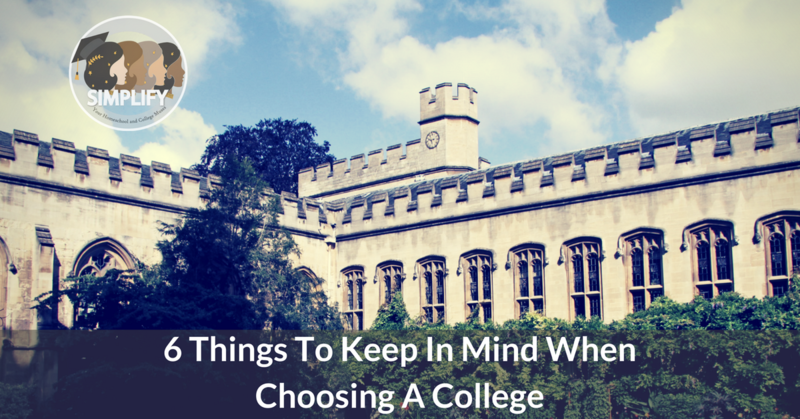 Choosing your college is your first big decision and can be stressful but remember there is no perfect choice. Spend some time weighing the pros and cons of each school while keeping in mind the points discussed in this post. Four years can go by so quickly so remember to breath and be mindful of the experiences you will have and reflect on for years to come. Next StoryTaking the SAT/ACT soon?